Julia Robitaille of New Hampshire wins the girls' race in Belfast, and Drew Thompson of Connecticut blitzes the boys' field. 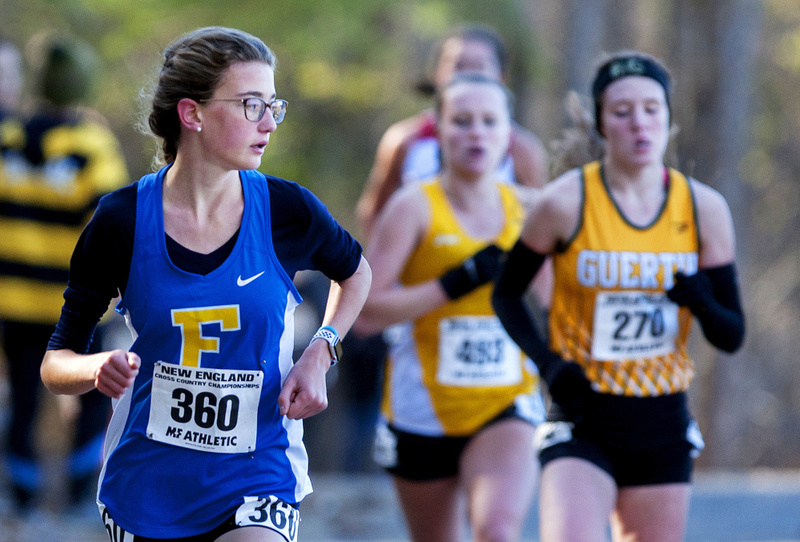 BELFAST — Two runners went under the girls’ course record Saturday at the New England high school cross country championships at Troy A. Howard Middle School. Julia Robitaille of Manchester West High in New Hampshire and Eleanor Lawler of South Kingstown, Rhode Island, surpassed the previous mark of 17 minutes, 47 seconds. Robitaille won the race in 17:31.65, while Lawler ran 17:40.55. 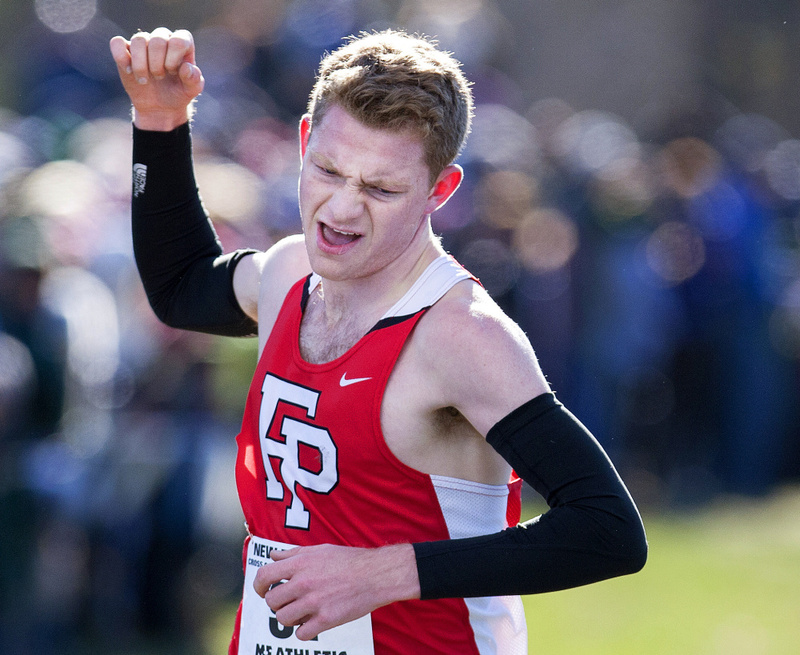 In the boys’ race, Luke Laverdiere of Yarmouth was looking to continue his undefeated season, but Drew Thompson of Fairfield Prep in Connecticut took the title in 15:16 – nine seconds slower than the record set by Josef Holt-Andrews of Telstar in 2013. Pinkerton Academy of Derry, New Hampshire, won the girls’ team title with 163 points, 20 better than Bishop Guertin, also of New Hampshire. Camden Hills finished 11th as the top Maine team, led by Grace Iltis in 23rd place (18:43.78). Xavier High of Middletown, Connecticut, won the boys’ competition with 74 points, nearly 30 ahead of Staples High of Westport, Connecticut. Deering placed 16th to lead Maine teams, paced by Yahya Nure’s 10th-place finish. In the first race of the day, the girls used the cold, dry conditions to their advantage. Robitaille, Lawler and four others – including Falmouth freshman Sofie Matson – went through the first mile in 5:35. Matson had already encountered success on this course, having won the Festival of Champions in 18:17. The lead group went through two miles at 11:30, with Matson falling off the pace at 11:46. As more runners ran through the course, the more the hardened soil turned to mud, but not before Robitaille crossed the finish line with a big smile, knowing she had shattered the course record set by Cassie Hintz of Old Town in 2006. Defending champion Jacqueline Gaughan of Exeter, New Hampshire, finished sixth with a time of 18:06.5. Matson placed 10th in 18:17.3. In the boys’ race, Laverdiere and Thompson stayed on each other’s hip and blazed through the first mile in 4:54. After the second mile, the ground had thawed and pockets of mud splattered the trails. Thompson started to pull away from Laverdiere, passing the 2-mile split in 9:58, with a four-second lead. Thompson steadily pulled away from there, his fist punching the air as he crossed in 15:16.66. Riley Fenoff of Danville, Vermont, was a distant second in 15:48.45, and Laverdiere came in 11 seconds later in eighth place.